See the IC-SW-8T2 for information on the updated version of this product. Built from the inside out for performance and durability the IC-8T-SW packs a lot of substance into commercial sound system. Most distributed audio systems are plagued with thin-sounding performances but the new IC-8T-SW in-ceiling subwoofer changes everything. Engineered for music reinforcement applications these unobtrusive easy-to-install loudspeakers feature a transformer-less design for 70.7V/100V distributed-line systems. Since transformers severely limit a subwoofer's capabilities this unique design is the perfect solution when building a great sounding commercial system. 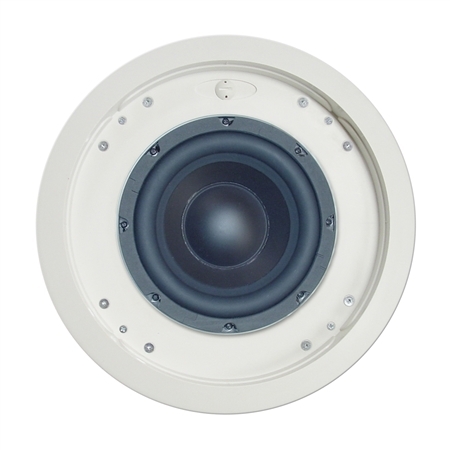 The IC-8T-SW adds more dimension to any in-ceiling configuration by using an 8-inch woofer 8-inch drone polypropylene cones and high-temperature voice coils in the woofer. While most subwoofers use a port to increase output the IC-8T-SW employs a bandpass design that utilizes a passive radiator. This eliminates a lot of the distortion and minimizes turbulence that is often present in ported designs. Maximum continuous output is a remarkable 111dB. And since AES rated sensitivity is 92dB adequate levels can be achieved with modest amplifier power using the IC-8T-SW.
Other key features of the IC-8T-SW include the ability to easily switch from low impedance to high impedance distributed-line applications as well as mono and two-channel inputs in low impedance modes. This durable subwoofer has an ABS plastic baffle formed steel back can and a four-point terminal strip input connector. While no longer in production the IC-8T-SW speakers are still owned and listened to by Klipsch fans around the world. To connect with other people who are passionate about audio and interested in Klipsch products visit our open forum bulletin board.